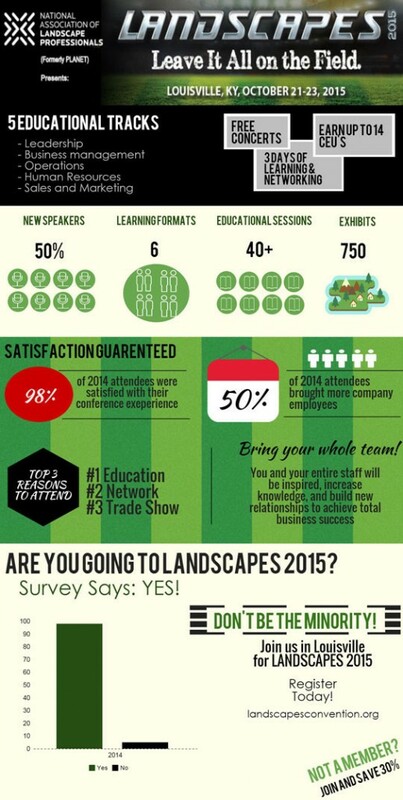 The National Association of Landscape Professionals (NALP) released the education schedule and opened online registration for its annual education convention Landscapes 2015 (formerly the Green Industry Conference), which is held in Louisville, Ky., in conjunction with GIE+EXPO and Hardscapes North America (HNA). This year’s convention will feature more than 40 sessions presented in five different learning formats, including town hall meetings, deep-dive workshops, lightning-round sessions, facilitated roundtable discussions, and new this year, NALP members can get one-on-one 75-minute business consultations with leading business owners in the industry who are part of the association’s Trailblazer program. Kirk Armstrong, who is an award-winning trainer, speaker and consultant with more than 20 years’ experience in the areas of sales, management, strategic planning, interpersonal communications and team building. Known for his experience in developing and training sales tactics and strategies, clients learn how to win more sales in less time, while creating a common sales language and culture for their organization. Landscapes 2015 is approved for Landscape Industry Certified recertification at 1 CEU per hour of instruction attended. Professional Grounds Management Society and HNA educational programs also qualify toward recertification. Educational sessions are also approved for Landscape Architecture Continuing Education System. Landscapes 2015 registration also includes registration to GIE+EXPO.